The help of social media and the alertness of a concerned resident helped police place a man under arrest after a theft of a pair of vehicles. Around 12:30 Monday afternoon the Huntingburg Police Department was notified of a stolen 2007 Ford Escape and were told that the vehicle was taken by 31-year old Steven Coble of Huntingburg. After taking the report and attempting to locate the stolen vehicle, officers were contacted again and advised that the Escape had been returned and a different vehicle, a beige 1997 Pontiac Sunfire, was taken from the same victim. An attempt to locate the Pontiac was put out as was a social media post asking for the public’s assistance in locating the vehicle. Around 4:30 Monday afternoon, officers were notified that an individual who had seen the post on social media spotted the vehicle on the north side of Jasper and contacted authorities immediately. Jasper Police were able to secure the vehicle and Coble until a Huntingburg Officer could arrive on scene. 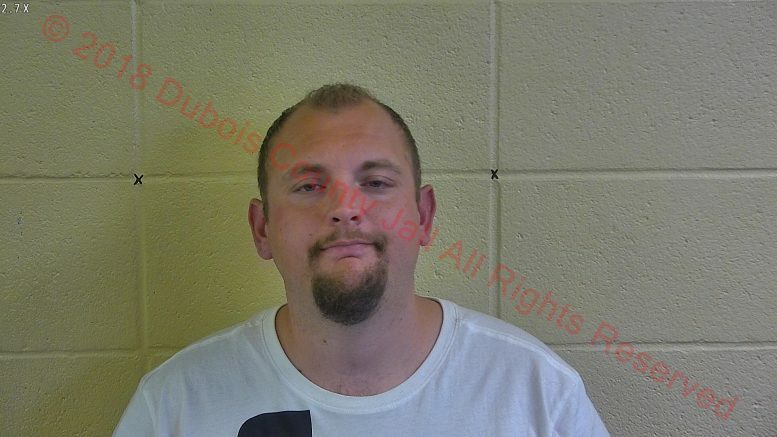 The vehicle was returned to the victim and Coble was taken to the Dubois County Security Center in Jasper where he was booked on two Level 6 felony counts of Auto Theft. Huntingburg Police,assisted by the Jasper Police Department, are sending thanks to the individual who spotted the vehicle and contacted authorities. Be the first to comment on "MAN ARRESTED-DOUBLE VEHICLE THEFT"